This Cutting Board with Knife & Blessing radiates warmth for your Shabbos table. Solid wood construction for years of use. The woods you see are the original, natural colors in nature-no stains or dyes have been used. It has a built in Sheffield steel knife, and a decorative brass inlay with the Hebrew words “HaMotzei Lechem Min HaAretz”(Bread of the Earth). This is a popular, practical, and meaningful Jewish wedding gift, one of Etz-Ron’s best sellers. -With the knife and brass inlay blessing with the Hebrew words “HaMotzei Lechem Min HaAretz” . -With the knife only (no blessing) and with a variety of woods laminated together. The cutting boards measure approximately 14 x 8 x 0.9H ” (36 x 23x 2 H cm). Each one is slightly different because at Etz-Ron all pieces are unique. 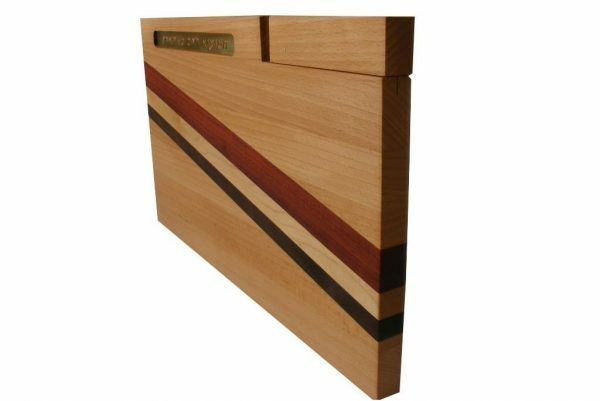 Care of your cutting board: To preserve it’s beauty, designate one side for cutting. Your cutting board will be finished with food safe mineral oil (paraffin oil), and to keep it looking beautiful, it is recommended to apply a new coat every month. It is a simple job: wipe on the oil and rub off the excess with a rag. This order is for Deana Binstock. The order is for three cutting boards, two to be sent to the USA and one to Israel.